The goal for every game in this list is Beat the Game, with the exception of Kirby's Star Stacker (the game is a puzzle game and is set for Hard Mode). This is a very strong list for the first Tiny10 REMIX and with practice it is estimated to take around 2.5 - 3 hours to complete. GB Runners has started incorporating some of the tutorials for these games on the site for all of you to see and get started contending that WR time! 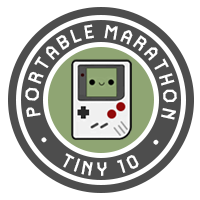 This marathon race is presented by RetroGamingLivetv and will be restreamed at: https://www.twitch.tv/retrogaminglivetv.